the history of supercross – a tale of days of old. A smattering of supercross background detail. 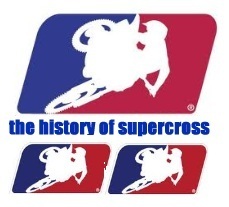 The History of Supercross - Bits Encircling yesteryear. Supercross, a derivative of motocross, has its own niche in the arena. The history of supercross would be virtually non-existent if not for the amazing television coverage given to the sport. Advertising and hype precede the events, generally offering top competition, great money purses and trophies, and held in large cities where attendance is guaranteed even if only locals are able to attend. Events are slower than motocross because of the technical skill required for successful negotiation of the track. Yes, the risks are greater, but the crowds and the riders love it. The history of supercross involves manmade tracks and off-road bikes. Heavy competition and deliberately difficult tracks create a challenge in finishing. Indoor racing pretty much eradicates weather problems. That means the construction of obstacle courses filled with turns, twists, small hills and jumps will not suffer from outside interference like weather and people sneaking in to practice in the arena. The area, built to specific degrees, ensures maximum challenge and qualified skill. This has led to racing teams and circuits, both feasible due to the large advertising market and draw to fans. Professional events have increased viewing for local amateur events, as well, since viewing the action in person holds more appeal than only seeing it on television. Racing promoter Michael Goodwin held the "Super Bowl of Motocross" at the Los Angeles Coliseum in 1972, leading to the supercross name. Motorcycle associations govern and sanction the supercross events, adding to their own niche in the history of supercross. The American Motorcyclist Association (AMA) is America's most prestigious cycle racing organization. 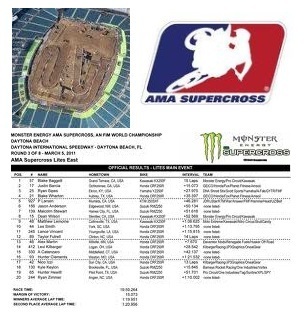 Supercross information & past events. Clear Channel Entertainment presented worldwide competition via television. THQ World Supercross GP features 17 rounds of competition and is produced and promoted by Clear Channel Entertainment. AMA sanctioned it in the US and the Federation Internationale de Motocyclisme (FIM), the world level motorcycling sports governing body. Bob ‘Hurricane' Hannah, inducted into the Motorcycle Hall of Fame in 1999, is an acknowledged Motorcycle Hall of Fame Legend. A likeable enthusiast, he built the positive reputation for all branches of motocross during the 1970s. Not only does Hannah hold seven AMA National Motocross Championships, he has achieved further recognition. He is one of two riders in AMA racing to have won championships in 125cc and 250cc motocross and Supercross competition. Mitch Payton, inducted into the Motorcycle Hall of Fame in 2010, is another hero of Supercross. Payton raced with his parents and brother, James Jr, advancing to competitive racing. At age 17, he won the 125cc class in desert racing. The following year his racing career ended with an injury. Purchasing a local Husqvarna shop while he was still 18, he started tuning and designing parts with some of the biggest motocross teams seeking his skill. Honda recruited Payton to run its 125 team in 1991 and he accepted, running other teams as well. His privateer teams have won 26 AMA championships since 1991. Wrapping it up and putting it in a nutshell, skill, risk, television coverage, advertising, fan support, locale and branding are the factors that have created the history of supercross. Those bit by the sport continue to work to improve it. The worldwide competition and television coverage encourage fans to attend local amateur events, producing more champions for the years ahead.